Still posting some of my favorite old topics for marry, date or dump, because I’m still on vacation. 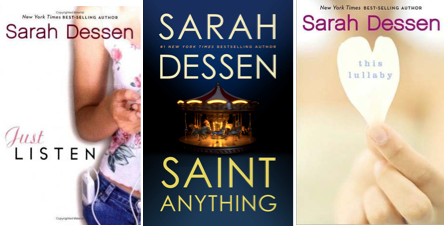 This one (originally posted in February 2014) was particularly fun, because I’ve now read all of Sarah Dessen’s novels so I feel like I can make a more informed decision. I challenged myself to pick all new characters from who I chose last time, but am mostly excited to see which characters from Sarah Dessen novels you want to marry, date, and dump! This entry was posted in Marry Date or Dump and tagged books, Sarah Dessen, YA by Alison Doherty. Bookmark the permalink. I have only ever read one Sarah Dessen book! Am I way missing out? I don’t know if you would like them as much as I do, because a lot of them can be a little light/formulaic (in the best way). But some of them are really heavy hitters. Which one did you read? I read Lock and Key.